Where can someone who is recognised wherever they go get away from it all? A superyacht, of course. Yachts owned by celebrities range in style and size, but one thing that unite these vessels is their owner's love for the sea. Kando 110 owned by NBA star Tony Parker In December 2018 Turkish yard AvA Yachts announced that it had sold the second hull in its 35 metre Kando 110 series to NBA star Tony Parker. Due for delivery in 2020, the steel and aluminium full displacement yacht will feature a bulbous bow and has been designed in-house. The 340GT yacht will accommodate 12 guests in six cabins with crew quarters for six including a separate captain’s double cabin. The four-decked yacht will feature a “light, contemporary interior décor” chosen by the basketball star and his wife, who are said to have put the yard through a rigorous selection process before choosing AvA for their new build. Where can someone who is recognised wherever they go get away from it all? A superyacht, of course. Yachts owned by celebrities range in style and size, but one thing that unite these vessels is their owner's love for the sea. In December 2018 Turkish yard AvA Yachts announced that it had sold the second hull in its 35 metre Kando 110 series to NBA star Tony Parker. Due for delivery in 2020, the steel and aluminium full displacement yacht will feature a bulbous bow and has been designed in-house. The 340GT yacht will accommodate 12 guests in six cabins with crew quarters for six including a separate captain’s double cabin. The four-decked yacht will feature a “light, contemporary interior décor” chosen by the basketball star and his wife, who are said to have put the yard through a rigorous selection process before choosing AvA for their new build. Tennis ace Rafael Nadal is the owner of a Monte Carlo Yachts 76 named Beethoven which he bought in 2016 and uses to unwind in the waters surrounding the Balearic Islands close to his home in Porto Cristo, Mallorca. Nadal has spoken openly about his love of yachting and his decision to invest in a yacht, telling Boat International, "Because I have a yacht, I am able to forget about everything and get away from that tiring stress. I do have a real passion for [superyachts]. It is rare that I see a superyacht from a distance and I don’t know its name. I know them all!" Launched by Lürssen in 2006, 93 metre sailing yacht Eos was bought by fashion designer Diane von Furstenburg and her husband IAC Chairman Barry Diller in 2009. The schooner features exterior design by Bill Langan and interior design by Francois Catroux with accommodation for 16 guests and 21 crew. Diller and von Furstenburg often use the yacht to host a star-studded group of friends with Bravo host Andy Cohen the latest celebrity spotted on this superyacht. While rather more sedate and old-fashioned than some of the world's largest superyachts, the 27 metre Astoria has certainly seen its fair share of rock and roll behaviour. Owned by Pink Floyd guitarist David Gilmour, the houseboat was built in 1911 for Fred Karno and designed so a 90-piece orchestra could play on its deck. Gilmour bought Astoria in 1986 and converted it into a recording studio complete with three cabins, a kitchen, bathroom and large main saloon. Parts of Pink Floyd's last three albums, along with many of Gilmour's solo releases, were recorded on board and the boat is permanently anchored on the River Thames at Hampton in Greater London. While rather more sedate and old-fashioned than some of the world's largest superyachts, the 27 metre Astoria has certainly seen its fair share of rock and roll behaviour. Owned by Pink Floyd guitarist David Gilmour, the houseboat was built in 1911 for Fred Karno and designed so a 90-piece orchestra could play on its deck. Gilmour bought Astoria in 1986 and converted it into a recording studio complete with three cabins, a kitchen, bathroom and large main saloon. 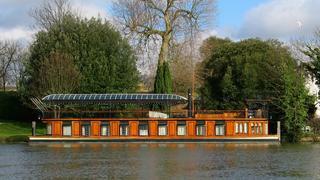 Parts of Pink Floyd's last three albums, along with many of Gilmour's solo releases, were recorded on board and the boat is permanently anchored on the River Thames at Hampton in Greater London. 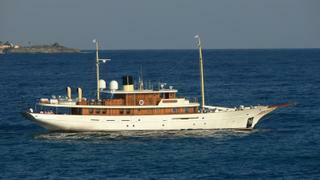 It was reported in January 2016 that Harry Potter author J. K. Rowling had bought classic superyacht Amphitrite. Previously known as Vajoliroja, this was once Johnny Depp's yacht and named after a blend of his name and the names of his ex-wife Vanessa Paradis and their two children Lilly-Rose and Jack. The yacht was once again listed for sale in September 2016 with an asking price of €17.5 million and eventually sold in July 2017 to an undisclosed buyer. 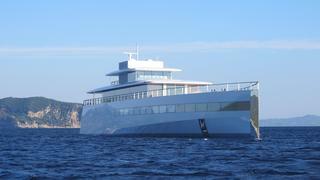 Built for the late Apple founder, but sadly not finished before his death, Steve Jobs’ yacht Venus has become as famous as the man himself. Incredibly private, extremely high-tech and covered in glass, the 78 metre Feadship yacht is one of the coolest superyachts for yachtspotters to track. Venus recently underwent a refit in France, revealing more details including her Mac computer-packed bridge and her tender garage hosting a Pascoe tender. With such a cinematic name, it's no surprise superyacht Seven Seas is owned by legendary Hollywood director Steven Spielberg. The 86 metre yacht was launched by acclaimed Dutch builder Oceanco in 2010, and Seven Seas has one of the best superyacht pools among other notable amenities. The steel hulled yacht features interior and exterior styling by Italian design house Nuvolari Lenard and was most recently refit at Amico in 2016. 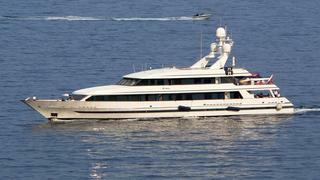 She accommodates 12 guests and can reach a maximum speed of 20 knots. For famous entrepreneur Richard Branson, his yacht and Caribbean island is where he gets away from the stresses of business life. The 32 metre catamaran superyacht Necker Belle was named after his island hideaway, Necker Island, in the B.V.I., which is one of the most exclusive private islands owned by celebrities. 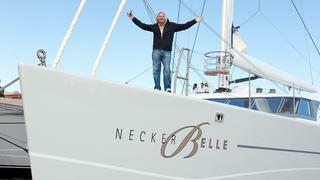 Built by CMN and launched in 2003, Necker Belle was sold by Branson to an undisclosed buyer in August 2018. The yacht is designed for partying with a huge sundeck for entertaining, lots of water toys and ample accommodations for guests and was also used to provide aid to those affected by hurricanes Irma and Maria. The modern classic commuter yacht Vendetta is just one of the many yachts that Billy Joel has owned. 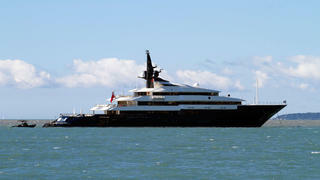 The "Piano Man" is a yacht fanatic, to the extent that he's even a celebrity yacht designer. Designed by Doug Zurn, the 17 metre Vendetta was created to be a true replica of the classic gentleman's commuter launches that were popularised in the 1920s for their quick speed to run down the Long Island Sound and into New York City. True to the intended form of the vessels, Billy Joel told Boat International that he has used the yacht to run from his home in Long Island to the City to perform in a concert. At one point, Billy Joel owned five yachts, including 29 metre Inace explorer yacht Audacious (re-named Miss Sarah J), which he converted to house a few of his motorcycles. Fashion designer Giorgio Armani has recently celebrated 40 years of life at sea and of course the fashion icon has a suitably stylish yacht. Enter the 65 metre Codecasa yacht Main, owned by Giorgio Armani, which has been designed inside and out with input from Armani. 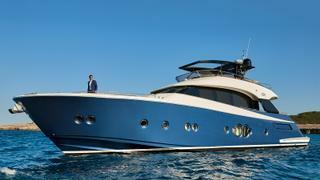 The exterior of the yacht is in an unusual dark green colour, which suits the angular, military inspired exterior lines. Inside, the yacht has a muted palette and features wow factors in a spiral staircase, gym, cinema and guest accommodation for 12. 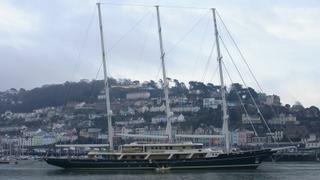 Believe the tabloids, and you might think that it's U2's frontman Bono that owns this yacht. 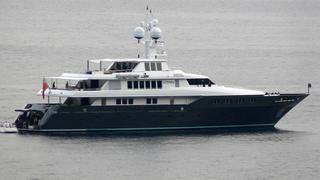 But it's actually U2's The Edge who owns superyacht Cyan. The 48.71 metre motor yacht was launched by Italian builder Codecasa in 1997 but has been kept in like new condition and is now available to charter with Burgess. The yacht's crew have very cool uniforms befitting a rockstar's boat, and Cyan is also known to have one of the best outdoor cinemas found on a superyacht. She accommodates 10 guests in a Franco & Anna Della Role interior. Another musician with a passion for yachting is Eric Clapton. Superyacht Va Bene is owned by Eric Clapton, although it is currently listed for sale with Burgess, and it's also reported that he owns the aptly named yacht Blue Guitar. The 46.51 metre motor yacht Va Bene was launched in 1992 by Cornelissen. 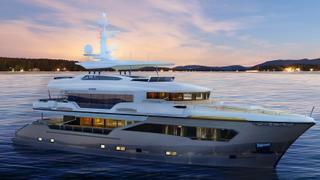 She features exterior design by the A Group and interiors and naval architecture by Richard Hein. The semi-displacement, tri-deck yacht enjoyed a refit in 2008 and hosts 12 guests in comfortable accommodations. 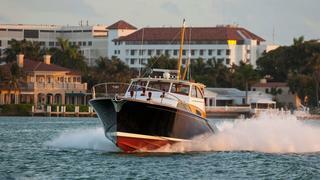 She also reaches a top speed of 18 knots powered by twin Caterpillar engines.